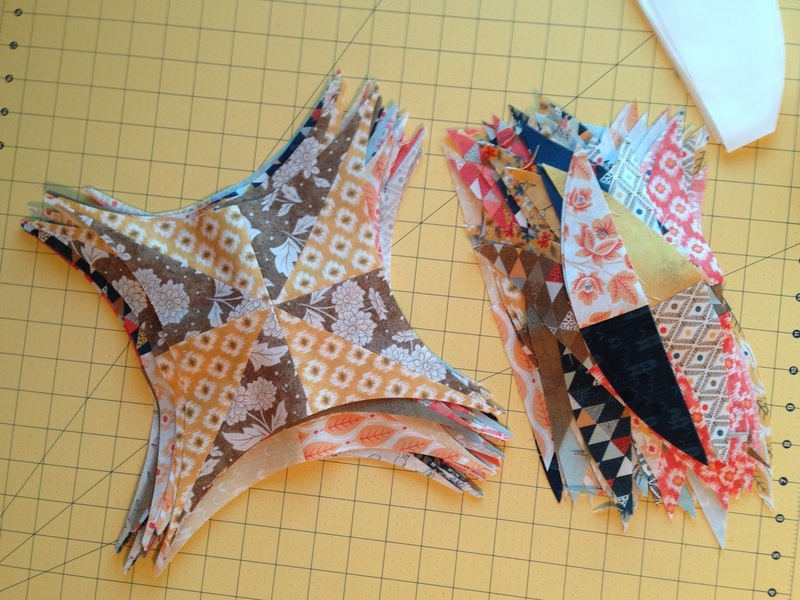 We have another QCR Sew-Along finish! 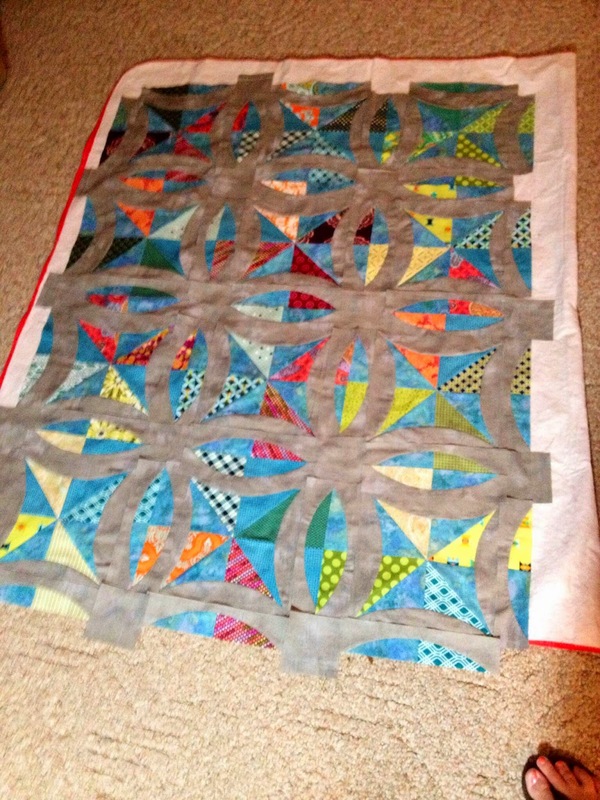 Here is Mickey's Metro Lattice flimsy. This top has 64 blocks and is 93 inches square. Mickey is going to quilt this top herself and is planning to piece a Metro Rings next. Great job Mickey, thanks for joining us! Dawn is getting a late start, first she had to wait for the pattern then she did some traveling. But here is her first Dancing Churndash Block, great start Dawn! For the details check out Dawn's blog post here. Great news, I just learned of a few more Moda Basic Building Block options. 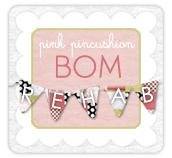 Primitive Gatherings is offering 3 BOM options, the traditional Bella Solid kit, as shown above, a primitive fabric option, and a Japanese fabric option. They all sound great to me, the details are here. And finally, I literally laughed out loud at all the comments from folks wondering what happened to the red couches and what was replacing them. We've lived in this house for 10 years now, and the house was 5 years old when we moved in, so it's time for some updates. 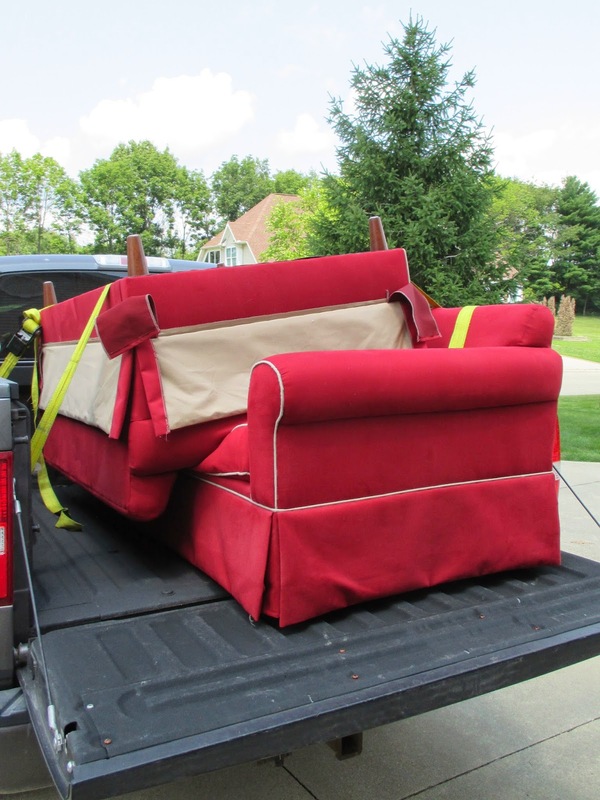 Those are the drapes from the sunroom (red couch room) that I took down and donated to GoodWill. The sun room is probably one of the nicest rooms in the house. It has a vaulted ceiling and nothing but windows on three sides. While those red couches looked great, they were not comfortable. That room is small and so I bought small furniture to fit in there, but we're not small people, and never really felt comfortable sitting in that room. There's new furniture coming but it's not here yet, we need new carpet and some paint before we add new furniture to the room, but I'll share pictures once it's done. I'm really looking forward to finally using that room. At Spring Market in Pittsburgh Moda had this quilt in their booth. It's called Moda Building Blocks. I fell in love with it, me and most everyone else at the show, and put it on my To Do List. 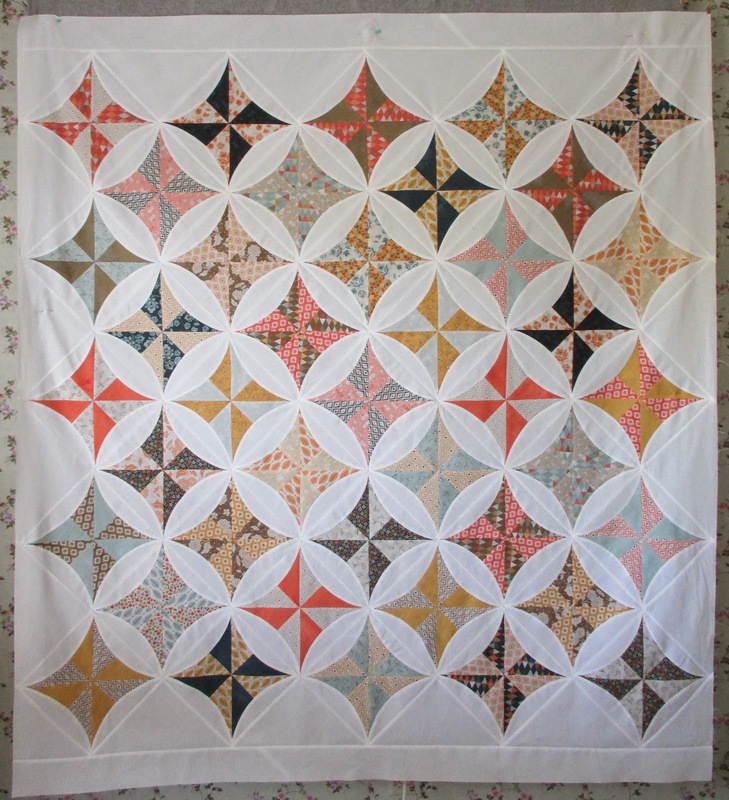 I wasn't sure how I was going to get this quilt made, I didn't know if it was a pattern, a kit, or what exactly, I just knew I wanted one of my very own. 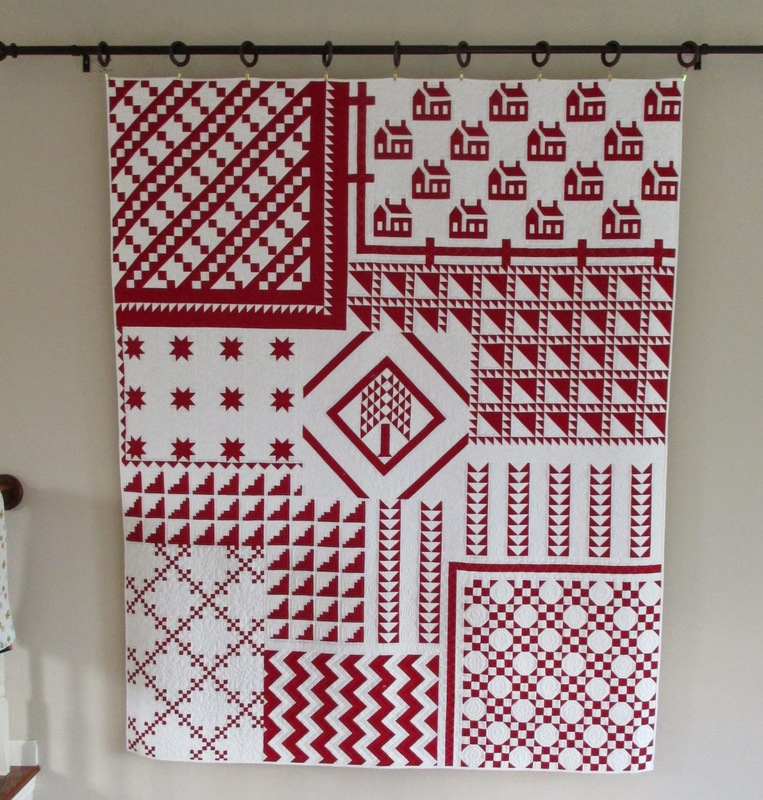 Right after market Fig Tree announced a block of the month for this pattern using a few of the Moda Bella Solids from this quilt and a few Fig Tree prints. I think it sold out in less than a week. But that was OK with me, I figured I would just wait for some of the other Moda designers to come up with their own take on this pattern. 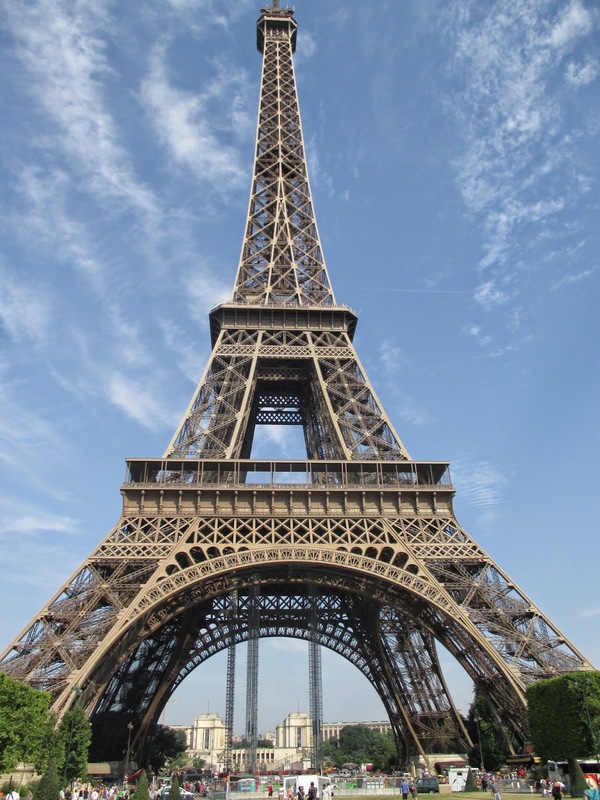 I think this pattern would work for any style of fabric and was eager to see French General, Bonnie and Camille, BasicGrey, Kate Spain and Edyta Sitar versions. 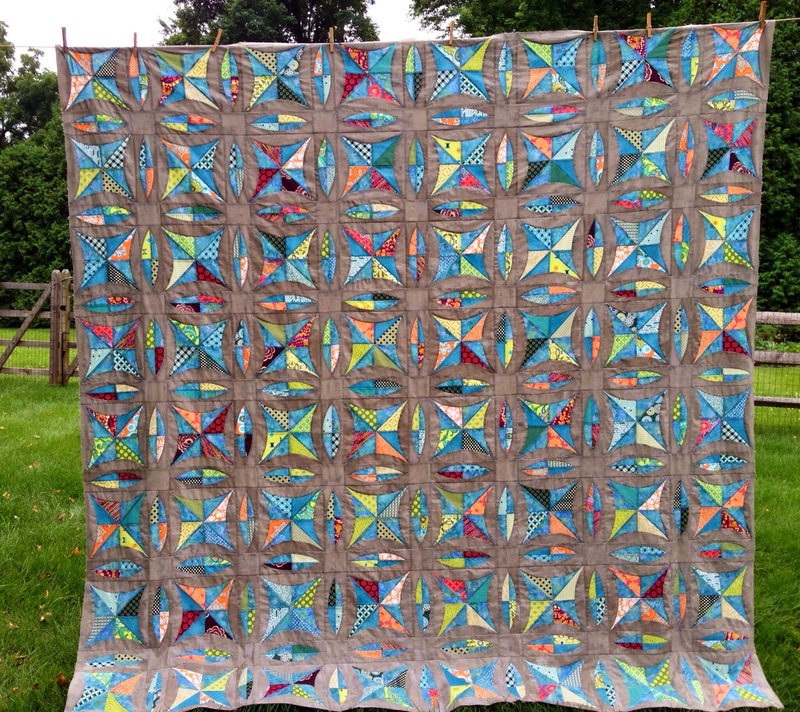 Well I've finally figured out that this quilt will be available as a kit in a quilt shop near you, using the Bella Solids in the market quilt, but no other Moda designers jumped on the Moda Building Blocks bandwagon. And even though I'm disappointed not to get to see some different versions, I am happy to report that Moda is offering the pattern without the kit. So WE can make our own versions. After mulling over all my options I've decided to make a polka dot version. I want a happy and fun Moda Building Blocks top and I love dots. I use dots every now and then but I've never made a quilt entirely of dots, until now. 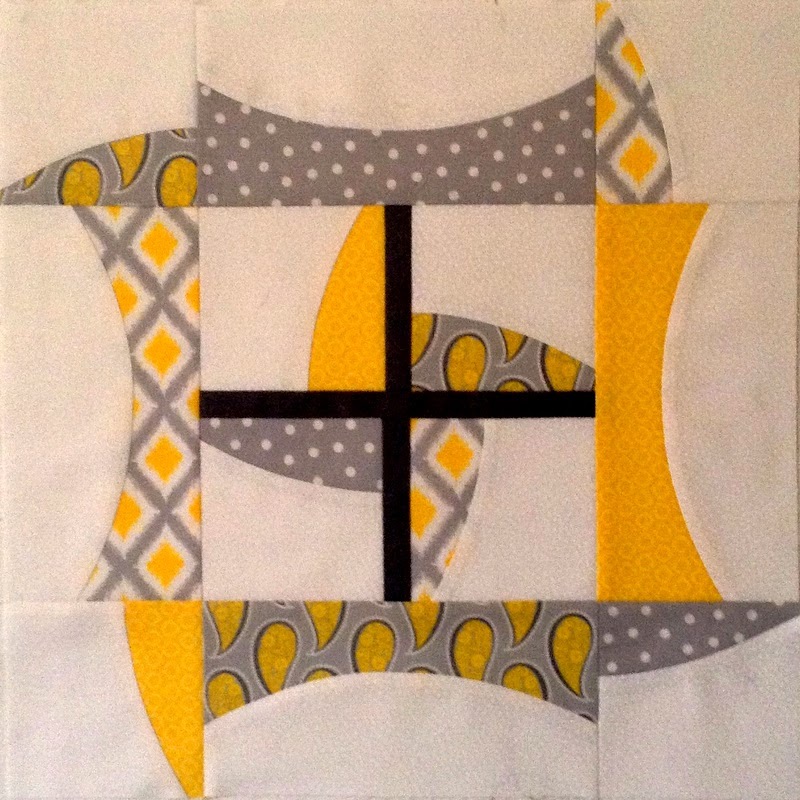 Once I decided to use dots for my Moda Building Blocks top I was eager to get started and made two blocks, two blocks not in the pattern but oh well, you know me, and how I like my quilts to be different. I have made a baby Swoon block and a mini Swoon quilt but never the original big Swoon block, and I want one in my sampler so that's the first block I made. Next up, I fell in love with all those alphabet quilts folks were making but didn't really want a whole alphabet quilt, but did want one block, so I made a "T" block too. So yes, I've made two blocks, neither of which is in the pattern, and now I have decided to wait on the remaining blocks until I have the actual Building Blocks pattern that will be available this fall. 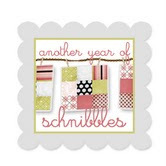 Which means you have a few weeks to pick out some fabric and come up with your own Moda Building Blocks quilt too! 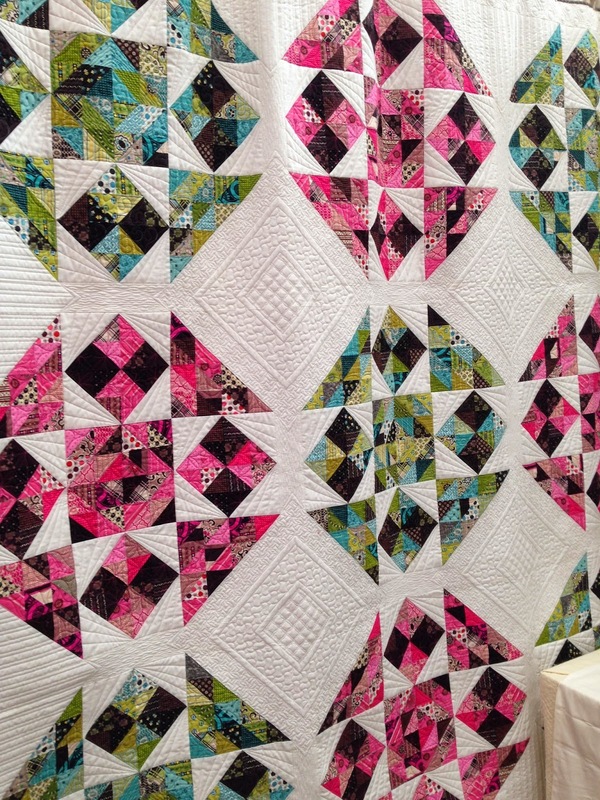 According to the Fat Quarter Shop the quilt finishes at 84" x 96" and has 48 blocks ranging in sizes from 36" to 6". 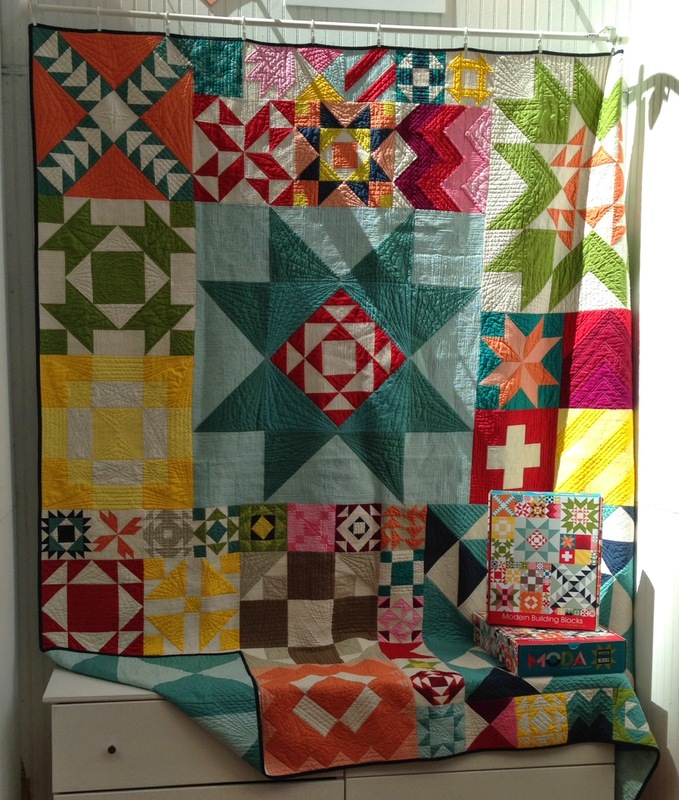 I think this quilt should be called Something for Everybody, because it is! Now I need to come up with something to keep me busy and out of trouble until September! So here's my Metro with no Lattice. I think I may be done. A friend suggested I add side borders, but right now I like having the border on the top and bottom only. There's just something about the simplicity of this top that appeals to me. I wonder sometimes if our quilts don't reflect what's going on in our lives. 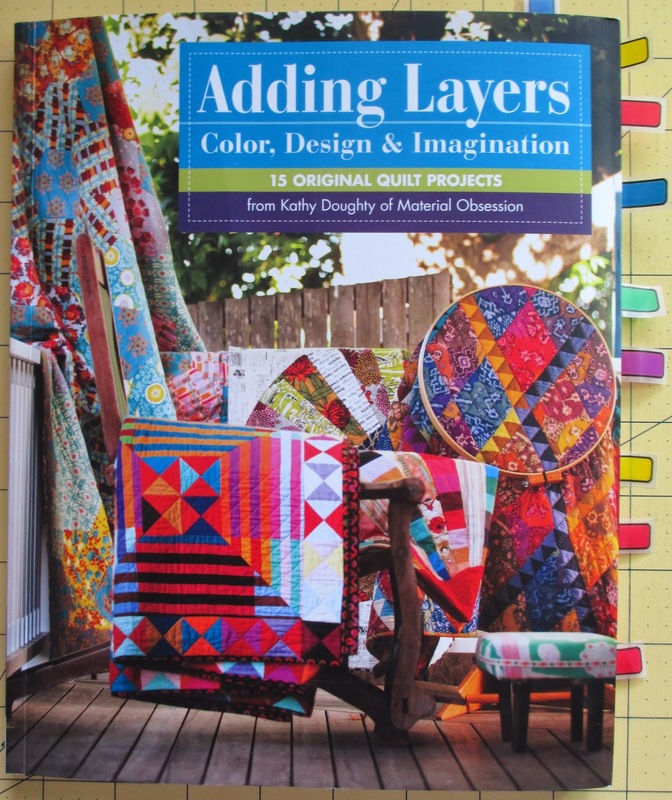 Right now I'm juggling some home improvement projects and wonder if my desire for calm is coming out in my quilt. I'll think about it and let me know what you think too. 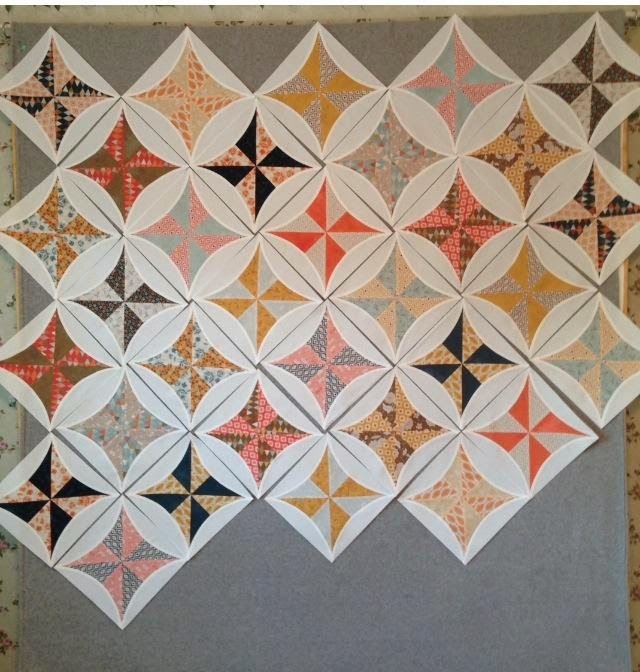 It finished at 65" x 71"
The pattern is Metro Lattice by Sew Kind of Wonderful. I did not add the sashing and set the blocks on point. It has approximately 514 pieces. Diana Young sent me several photos of her Metro Rings. Diana is going with a fractured Metro Rings look that I'm really loving. And here is Mickey's progress. Which I think is looking great. 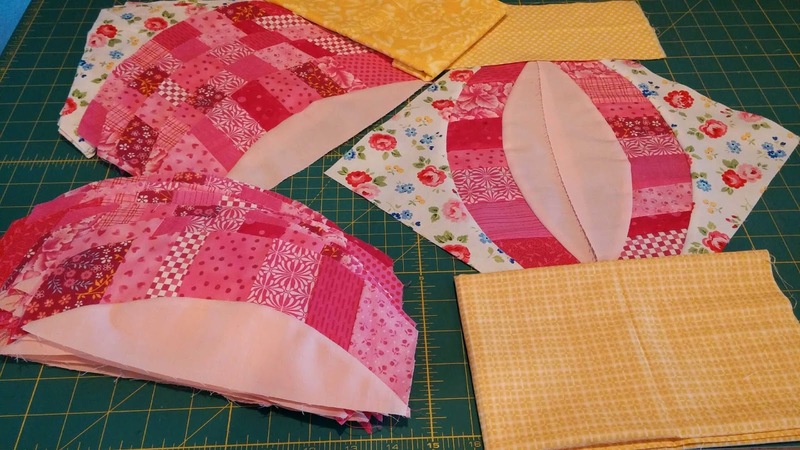 Nicole is going to town on several QCR projects, I hope you're following her blog, I think she had the first official finish. Check out Sister's Choice in my blog list if you've missed her progress. 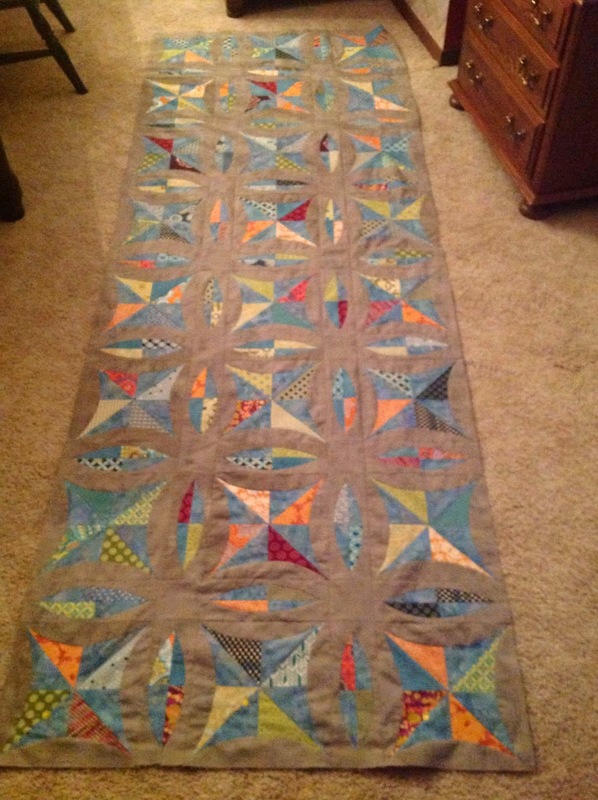 Vicky/LA Quilter and Kristen/Meadowbrook also posted some updates on their blogs this week of their progress. They are also in my blog list so check them out if you happened to miss their updates on Monday. 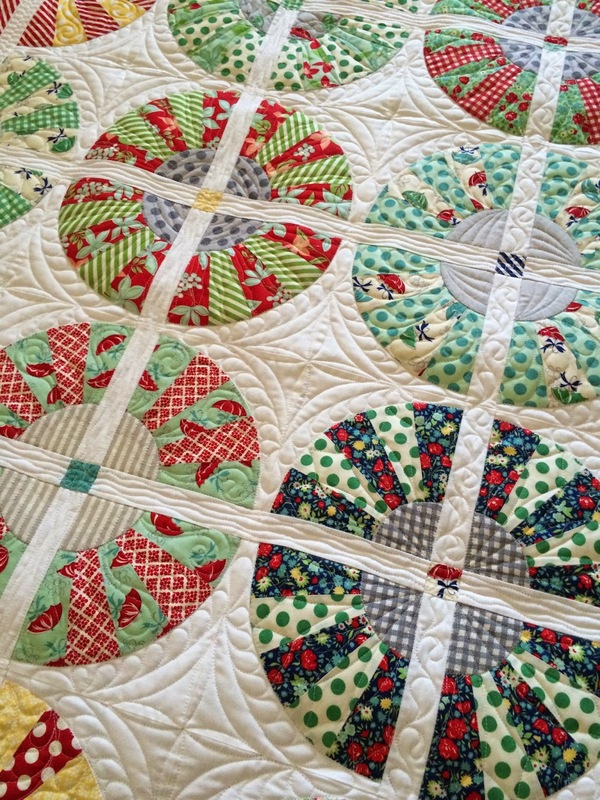 The spring quilts are put up and the summer quilts are out!. 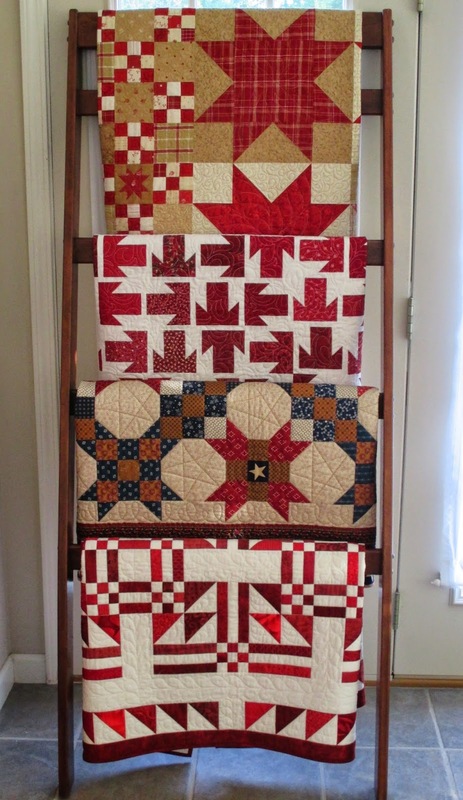 And summer quilts to me are red quilts! Victory Gardens and Dulcinea on the red couches. Red and White Tribute in living room. 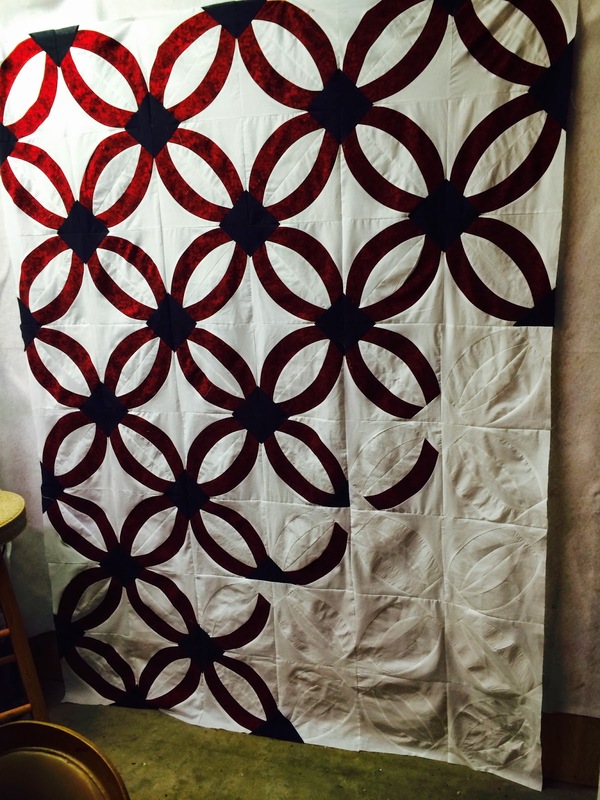 A table topper from a 4th of July sew along in kitchen, a fellow quilter out there has this topper's twin, hope it's out too! Top to bottom, Nantucket, T Stands for Thelma, One Star Two Star, and Father's Fancy! 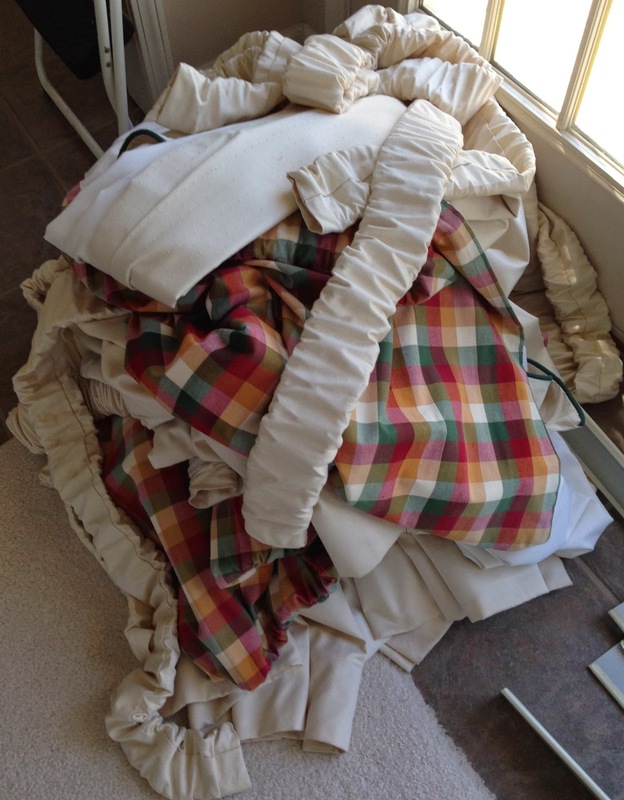 Out of the 8 quilts out for summer, 5 were sew along quilts. Anytime is a perfect time for a sew along, but evidently I like summer sew alongs. 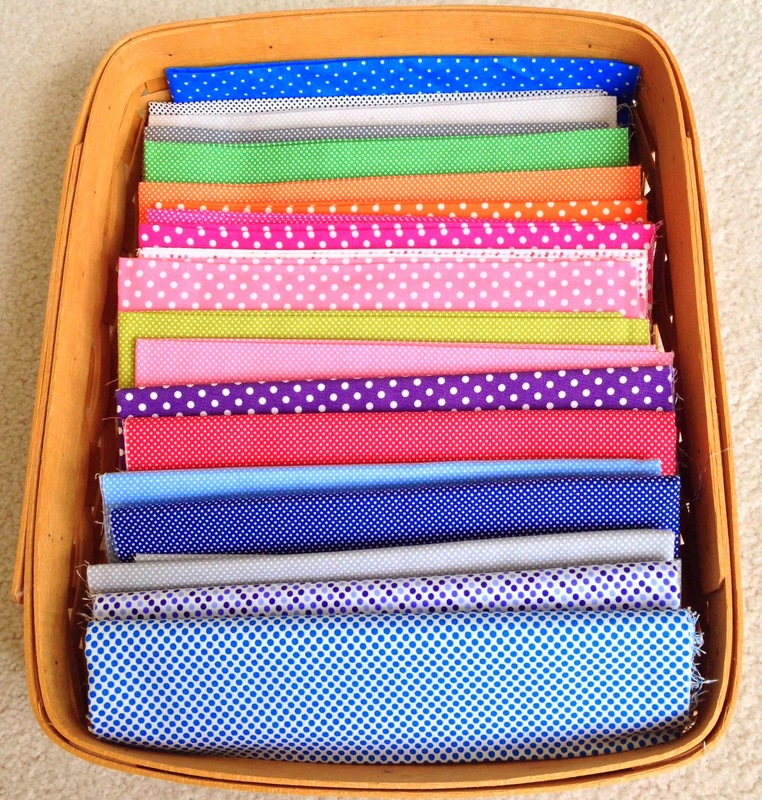 And speaking of sew alongs, I'll have some QCR Sew Along pictures to share next week, mine and a few others! Best wishes for a safe and happy holiday weekend. Happy July! The year's half over, I wonder if I've accomplished half of what I wanted to when this year started, I'll need to think about that. I've pieced and trimmed the center sections of my Metro Lattice blocks. The next step, adding the background pieces. I've heard from a few folks sewing along, no pictures to share yet, hopefully soon. Dawn is going to be waiting a little bit longer for her Dancing Churndash pattern and will be getting a later start, but that's OK, we have a couple of months and plenty of time. Maybe some new folks will give it a go when some of our projects start coming to life.